At the annual fall meeting of the Little League® International Board of Directors, dates for the nine 2016 Little League World Series Tournaments were approved. The 2016 Little League World Series tournaments begin with the Big League Baseball World Series in Easley, S.C. on July 26. 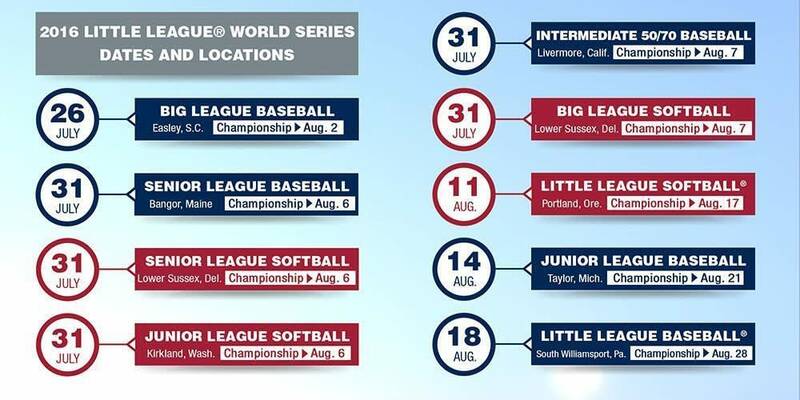 On July 31, five additional World Series tournaments will commence, setting up for an action-packed Championship Weekend on Aug. 6 and 7. The tournaments conclude with the Little League Baseball® World Series Championship Game on Sunday, Aug. 28 in South Williamsport, Pa. Over the course of 34 days, Little Leaguers® ages 11 to 18 from around the world will play more than 225 baseball and softball games to determine nine World Series champions.